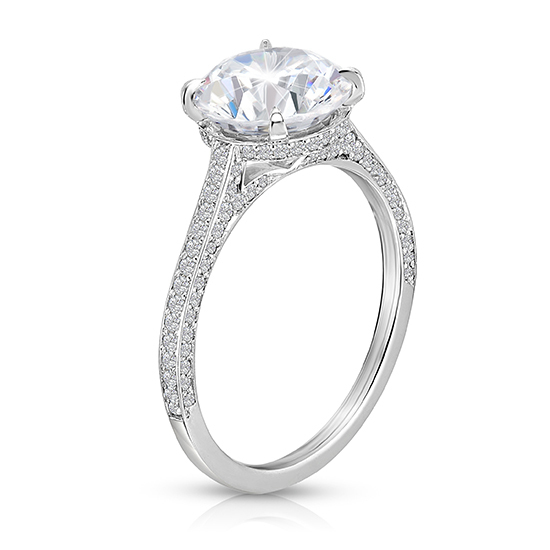 This stunning round brilliant cut diamond set in platinum with micro pave is called the Royal setting. 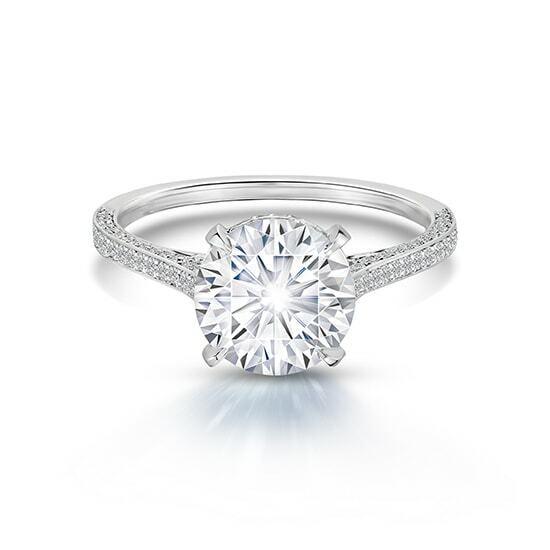 This ring is a masterpiece that features the tiniest round brilliant cut diamonds, meticulously set on all three sides of the upper half of the band. Diamonds are also expertly set on the platinum circle on which the diamond sits, revealing the entire diamond underneath. Truly a feat of engineering, no one has been able to set diamonds so precisely in three rows, with so little metal before. Thanks to Douglas Elliott and his team, we were able to make it happen! The Royal is also embellished with beautiful shoulders that extend from the band up to the widest part of the diamond. Although created with extreme detail, the design remains simple and elegant. This setting will sit flush with any wedding band. Shown here with a 2.03 carat H color VVS2 clarity Round Brilliant Cut diamond. Available in all stone shapes from 0.75 carats on up. This setting can be made in platinum, 18k yellow gold, or 18k rose gold. Please contact us to schedule an appointment with a diamond specialist and explore the different options available to you. We look forward to creating your perfect ring.